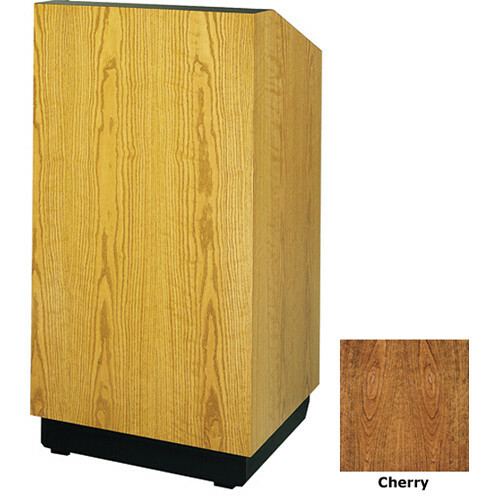 The Da-Lite Lexington 42" Special Needs Floor Lectern with Gooseneck Microphone and Electric Height Adjustment is ADA (Americans with Disabilities Act) compliant. There is room in back to accommodate a wheelchair and the lectern is electrically height adjustable from a sitting position of 38 to 46" if you're standing. A 120VAC, 60Hz AmpliVox 70 watt amp sound system is provided, featuring multiple inputs and outputs including two aux outputs for optional satellite speakers. The built-in 70 watt speaker includes a 6.5" woofer and high-output tweeter. The system features a dynamic gooseneck microphone and mount. There are Braille identifications on all control components. There is also an aux line as well as lines for mic in/out. The spacious reading surface has room for a 3-ring binder. Four casters, two lockable, allow you to roll the lectern to its chosen location. The straight corners give the Lexington a contemporary, sleek appearance. Box Dimensions (LxWxH) 47.0 x 36.0 x 36.0"